Teleflora is committed to helping the world send its heartfelt messages, across town or across the country, through the welcome gift of flowers. We partner with the most experienced and highest quality neighborhood florists, and our bouquets are available for same-day delivery and always beautifully designed, hand-arranged and hand-delivered right to the recipient's door step. When a customer buys a traditional looking bouquet from some other online flower companies, the order is sent to a warehouse somewhere in the middle of the country, where the flowers are packed into a cardboard box and loaded onto a truck to be shipped all over the country. No artistry. No style. And most importantly, no florist. Teleflora sends all of its orders to local florists. By supporting local businesses we strengthen entire communities. That's the Teleflora difference! Watch our talking flowers video and funny commercials to see how different we are from our competitors. Teleflora's talking flowers ad campaign debuted during the Super Bowl 2009. In 2010, we aired our second Big Game spot. 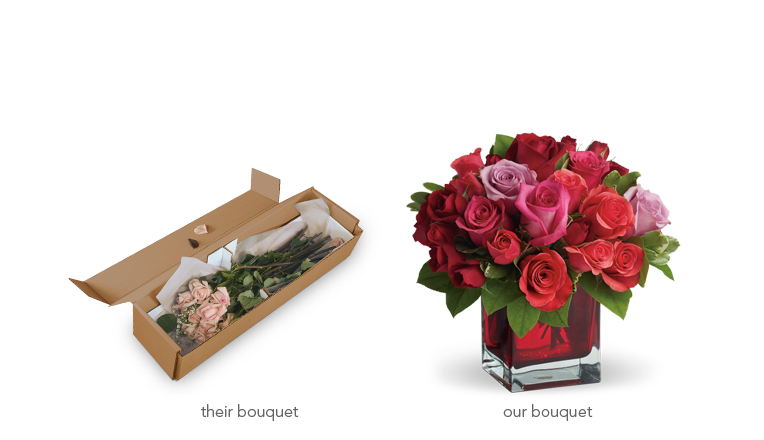 These videos show sarcastic talking wilted flowers-in-a-box delivered to a woman at work, juxtapose to Teleflora's hand-delivered, hand-arranged by a florist bouquet. It makes for one funny commercial and clearly points out the Teleflora Difference! We're excited to debut or third Super Bowl commercial with Faith Hill during the second quarter of Super Bowl 2011. This very special commercial features celebrated musician Faith Hill in the recording studio. When a young sound technician needs her help sending flowers to his girlfriend, the commercial takes a hilarious and unexpected twist. Check out our commercial for Super Bowl XLV and all of our commercials right here!